ShyRanger's Blog: Crisis on Earth-X: The Ultimate Superhero Time! Crisis on Earth-X: The Ultimate Superhero Time! I don't really post about them but I'm a huge fan of The CW's DCTV (or as I like to call it, "Superhero Time"). The latter 2000s-early 2010s belonged to Smallville which I'll forever hold dear to me, but now it's a whole 'nother time when their is SO much more going on, which began just over five years ago with Arrow. While Supergirl isn't always as good, I consider all four "Arrowverse" shows my favorites. I've especially enjoyed The Flash the moment it premiered and Legends of Tomorrow at times has been the absolute best, in paticular season 2's "Leigon of Doom" plotline. I kind of like to look at it as Arrow has the best choreographed fight scenes, The Flash best humor and Legends best episode plots. 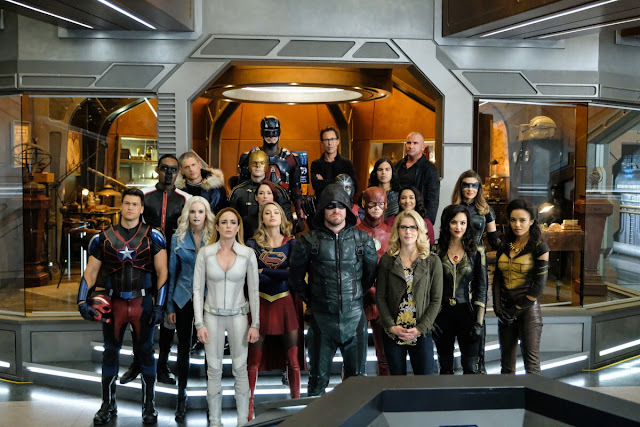 Going into this years big crossover, Crisis on Earth-X, I wondered how much all the shows would mesh together, after last years Invasion! crossover had each part of it more focused on the show it was on (The Flash beginning, ending on Legends, with Arrow's 100th episode in the middle). It turns out, everything gelled really well and it was easy to forget it was technically Supergirl, not The Flash the first hour when Barry/Iris tried to have their wedding. Joining Kara, Oliver, Barry and Sara each doing their thing in their own cities was a nice way to kick things off, sort of a quick rundown for each show. Mick had the best one-liners and I loved he was at the wedding when he really shouldn't have been. Gotta hope the next one involves more of the Supergirl cast. Winn's due to meet everyone now and it would be nice to see J'onn fighting alongside the others sometime. Also gotta wonder if John Wesley Shipp was even offered to be in this. I thought it was strange Jay wasn't even mentioned. I get Joe not appearing much, but come on, even Wally was only in the first hour. So aside from a lack a screentime for a few, it was great seeing everyone work together, especially with the whole Stein/Jax plotline coming over. It sure felt like more Firestorm than what we ever got from Legends. And wow, just wow. I really thought Stein was simply going to stay home at the end. Elsewhere, I thought Thawne switching to Wells appearance made sense after previously getting killed by Black Flash and it kind of felt like a homage when they brokeout the wheelchair (turns out it was a money saver as Matt Letscher was never asked back for this). I liked Dark Arrow being in a relationship with Overgirl and it was awesome seeing all the Earth-X counterparts including giving us another version of Leonard Snart. This kind of makes me wish The CW would do a mini DC movie separate from the shows episode counts someday but a special title card for the crossover (as was the case here) is close enough for them I imagine.